Turkey and Qatar signed several cooperation agreements during President Recep Tayyip Erdoğan's visit to capital Doha on Wednesday. 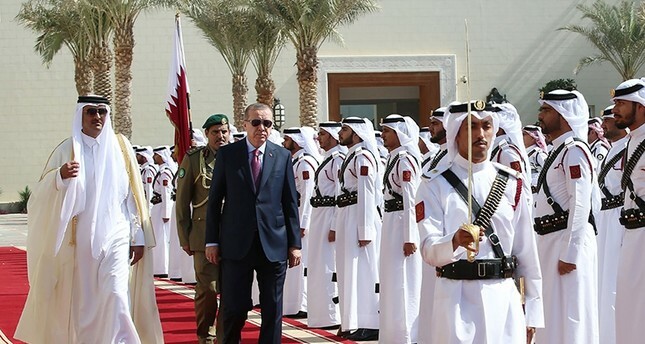 Erdoğan arrived in Qatar late Tuesday as part of his tour to Gulf states that began Monday with a visit to Kuwait. He met Qatari Emir Tamim bin Hamad Al-Thani before attending the agreement signing ceremony at the 3rd High Strategic Committee meeting. The agreements included a memorandum of understanding on central banking, tourism and judicial education; a declaration of intention in the meteorological field; cooperation agreements on "friendly harbors" and "criminal subjects" as well as media, technology and humanitarian assistance issues. The Qatari emir had given a warm welcome to the president and hosted him for an official reception at Emir-i Diwan government complex.